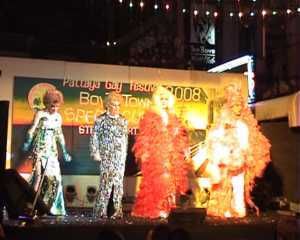 A famous stretch of Boyztown in South Pattaya was closed off on the evening of the 2nd December to make way for the spectacular Pattaya Gay Festival Street Party 2008. By late evening the entire street was heaving with people enjoying the lavish entertainment and competitions all put on in great style by local bars, restaurants and hotels in the Pattayaland zone. The whole affair is part of a 4 day PGF charity appeal to raise funds to help the Heartt 2000 AIDS programme in Pattaya. DD - you need to alert Blackgang immediately! Looking at the pic I wonder if it's a gay parade or a frustrated wannabe katoeys exhibition. Always wondered why gays like to show of the most ridiculous aspect of their difference. Maybe a gay secret ? KW asked me to post it, no idea why. Last edited by killerbees; 04-12-2008 at 08:12 AM.